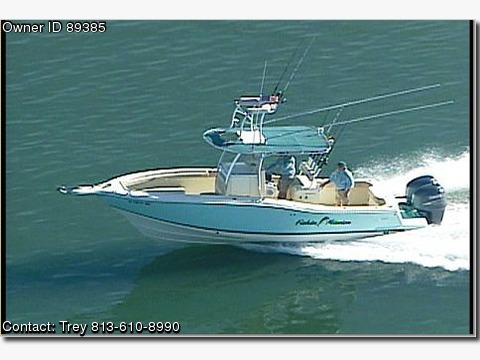 This is a great boat ready for fishing or just an enjoyable day on the water. Powered with twin 225 4 Stroke Yamaha engines. Electronics include Furuno bottom finder and Furuno GPS chart plotter (with charts for all of Florida). Other features: VHF radio, Stereo, large T-Top, front bimini (provides a lot of shade), flushable head, large rear live well, two built-in coolers, two fish boxes, tackle/prep station with sink and storage drawers, in-floor lockable rod storage, custom crows nest, curtains for T-Top with side wings, outriggers, 13 rod holders, fresh and raw water wash downs, roomy front area with bench seating. Also lots of room in the rear for fishing includes swim platform with ladder. This boat has a great layout and offers lots of storage.